Corner Canyon Academy offers a great pre kindergarten in Utah. Our four- to five-year-old pre-kindergarten Reading Readiness curriculum is designed specifically to prepare our students to enter public or private kindergarten on the highest level of academic, social, and physical skills possible. Our carefully taught lessons consist of phonics, reading, writing, math, science, geography, social sciences, history, and art. A nurturing, learning environment in our interactive indoor playroom and physical fitness room help to build happy and confident children. Our students will be prepared to be leaders in kindergarten. We have stepped up our curriculum to a higher level of teaching, learning, and participation. In doing so, we have created a pre kindergarten in Utah, reading readiness program that is unmatched by any other pre-kindergarten program. Our stepping stone reading program begins with sight, sound, letter recognition, and writing. We then move into mastering reading and writing long and short vowels, blending, stretching, diagraphs, rhyming, and comprehension. Mastering these skills prepares our students to move on to one, two, and three letter word recognition. This is a critical progression into the student’s ability to begin reading our early learning reading books. Children are capable of learning to read at an early age if they have the opportunity to participate in a strong phonics-based reading program. Our classroom environment and lessons are specifically designed to maximize each student’s individual learning ability. These skills will prepare our four- to five-year-old pre-kindergarten students to enter kindergarten with confidence. We evaluate the children throughout the year. This gives us the tools to consistently address each child’s needs. Parents are given a progress evaluation in January and in June at parent-teacher conferences. We have fine tuned this program over the years in order to optimize our students’ abilities in our phonics and reading program. This solidifies their success in reading, allowing them to enter kindergarten as a confident and happy reader. Numbers are essential in our pre-kindergarten curriculum. We reinforce math concepts with number recognition, counting, writing numbers, sorting, and grouping. Many of our activities involve these math concepts. Hands on activities are essential in our learning of numbers and math skills. We introduce the addition symbol and later, the subtraction symbol, through simple math. These concepts are reinforced in other subjects throughout the day. These math skills give them the foundation for understanding and participating in addition and subtraction exercises in kindergarten. If you walk into our school during singing time, your heart will be filled with joy! It will bring a smile to your face when you hear the children’s singing voices fill our school with happiness and love. We sing alphabet songs, theme songs, action songs, and many other fun and exciting melodies. Music inspires children and sets the mood for our day of learning! Many of the songs that the children learn are shared with parents during programs during the school year. Four- to five-year-olds are refining their eye-hand coordination and small motor muscles. This is achieved through activities with cutting, gluing, painting, coloring, tracing, drawing, scribbling, and other exercises in creativity. We use many different mediums including paint, watercolor, crayons, colored pencils, markers, Play-Doh, chalk, sand, and other elements of color and texture. Creativity and positive direction by nurturing teachers put into motion the desire to be creative and a love of artistic expression. Indoor and outdoor physical activities and exercise are a must for healthy children. Physical awareness and development is achieved through stretching, balancing, throwing, catching, bouncing, creative movement, and role play to music. Organized group activities are introduced at this level to incorporate an understanding of healthy competition. It’s important to engage in these activities both outdoors and indoors, especially during the cold winter months. Children have quality interaction with same-age peers in our spacious, creative, indoor play room. This beautiful facility is unique to Corner Canyon Academy. We create a safe, warm, atmosphere that was designed to maximize children’s creativity and imagination through role play. This interactive play strengthens character, self-esteem, speech, and the ability to associate with peers of a similar age on a level that outdoor play does not accomplish. Indoor play also allows us to realize these goals during the cold winter months when poor weather and unhealthy air quality limit our time outside. Outdoor play is essential for healthy growing children. Within our fabulous climbing clubhouse are slides, swings, a climbing wall, tire swing, ship wheel, binoculars, and an eagles nest. 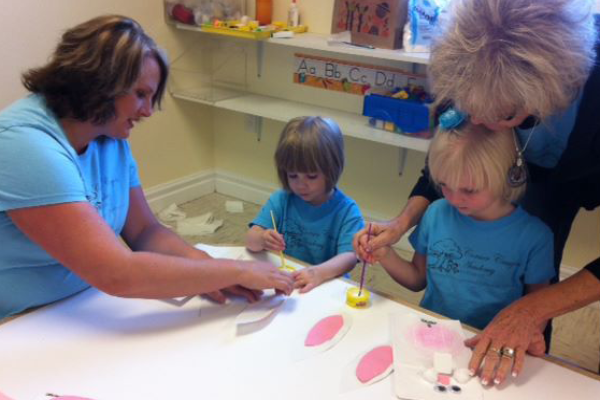 Imagination is encouraged as they interact with their peers in this fun clubhouse. Our colorful playhouse is on a deck surrounding a tree and is enclosed by a white picket fence. Outdoor picnic tables, benches, and flower pots are nestled under shade trees on the deck creating an inviting social environment. Within the playhouse, there are dress-up clothes, table, chairs, and play dishes to encourage outdoor adventures. We also have a climbing dome, airplane teeter-totter and helicopter where the children can climb, explore, and imagine! These items, as well as the clubhouse, are placed on soft outdoor playground wood chips, which provides a safe, soft landing for jumping and running. Our large grassy shaded lawn and soccer goals provide many opportunities for children to play outdoor games such as soccer, kickball, football, hide-n-seek, and tag. We also have cement pad that serves as a basketball court and space for our mini swimming pool that we use for many outdoor water experiences. Our field trips are chosen specifically to enhance the units of study in our school. Parents always accompany our children on our field trips to ensure safety and serve as fun support for the children. Participating in a hands on experience with their child enables parents to encourage them to share new experiences and knowledge they have gained with the entire family. The field trips also create an opportunity for parents and students to meet and mingle with other pre-kindergarten parents and students. Many friendships are created and nurtured through our pre-kindergarten field trips! Our snack time is meant for a ‘brain power boost’ and is a very important part of our day. Each child is assigned to bring a healthy snack to share with their class on a rotational basis. This is a very special day for your child; on this day, they are the V.I.P., or Very Important Person. They are the teacher leader and helper on this day and are given very special assignments and responsibilities within the class. The children really look forward to their V.I.P. day. Snack time provides additional reinforcement to our daily phonics study. Parents are encouraged to help their child choose a snack that corresponds with the specific letter or subject being taught. We encourage healthy snacks like fruits, vegetables, protein, dairy products, crackers, and breads. (Special accommodations are made if your child has an allergy). In sharing snack assignments, it allows parents the comfort of knowing their child is enjoying a healthy ‘brain power’ snack each day in preschool. Your four- to five-year-old children will be involved in a Christmas program in December. They will also be celebrating their graduation from pre-kindergarten with a graduation program in the spring. This gives the children an opportunity to demonstrate many of the things that they have learned for their family and friends. This is a fun opportunity for your child to participate in a fun, safe, encouraging, and character-building experience with their peers. Every child’s birthday is an important event! We celebrate everyone’s birthday throughout the year in a special way. If your child’s birthday falls when we are not in session, we celebrate on a day that we are in school. This is a very special day for your child and we want them to have a very happy birthday!